You’ve probably noticed the introduction of red, underscored links within reviews and Core Stories I’ve written over the last few months, directing you to other reviews within The Apple Box and cross-referencing my content. The trouble is, “The Apple Box” has existed in many forms. Back in 2012, when it launched in its original form, it lived at http://the-apple-box.blogspot.ca, before I began using the domain http://www.appleboxreviews.ca. Cost-cutting measures in 2015 led to a temporary migration to https://appleboxreviews.wordpress.com, until settling lastly into its present home at http://www.appleboxreviews.com. Unfortunately, as articles have shifted from site to site, many URLs no longer worked — and hundreds of my earlier reviews were either trapped at different web sites or lost in the online ether. But no longer. For the first time, every one of my reviews, from All is Lost to Zootopia, are now all in one place. Between 170+ full-length reviews and hundreds more capsule critiques, it puts over 600 movie reviews right at your fingertips. 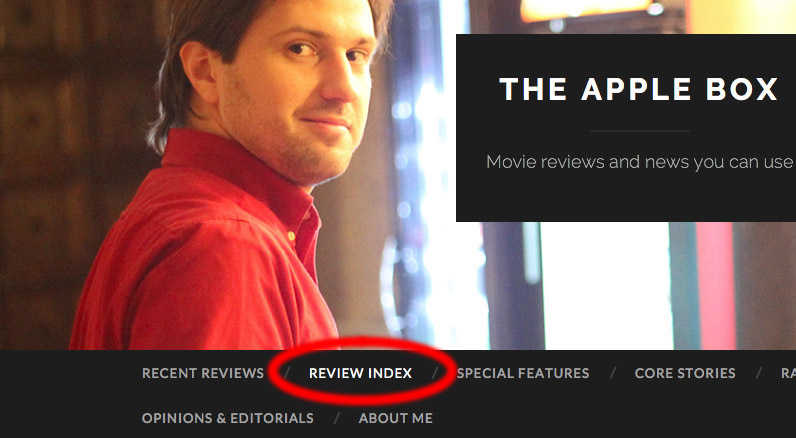 The new navigation menu at the top of any page also now has a “REVIEW INDEX” tab, leading an alphabetical listing of every review of mine since 2011’s The Girl with the Dragon Tattoo and Mission: Impossible — Ghost Protocol, broken down by letter. Every week going forward, the listings will be updated with any new reviews, to save from blind searching or endless scrolling on the “RECENT REVIEWS” page. While importing reviews from older versions of The Apple Box, each has been reformatted to fit the new page template, including links within each review directing to related references. Beyond updates to the look of each review, however, every word remains exactly as they existed when first written, unaltered. The search field will remain in the right-hand sidebar for all your needs, but if you need another way to find what you’re looking for — or if you’d just like to browse through older reviews without having to know exactly what to search for — take a perusal when you get a chance. And if you’ve got any suggestions for other improvements that can be made to The Apple Box, please sound off below!